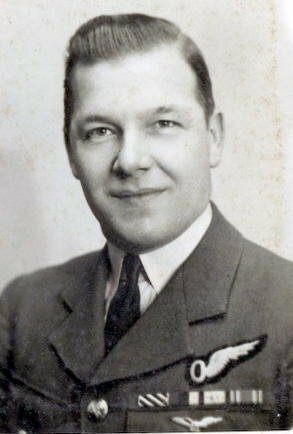 Evangelical Christian faith was very important to Tom his whole life but never more so than during his time with 97 Squadron. Tom was part of the Charles Owen Crew which saw action in the Battle of Berlin and was involved in several of the squadrons famous moments, *Black Thursday and the Nuremberg raid, known in the crew as "Nigel" as the crew had two Toms it was decided one of them would change his name. Tom decided he wanted to be the one to change names and chose "Nigel" after the actor Nigel Bruce famous at the time for playing Dr.Watson in the Sherlock Holmes films. He would later star in a TV interview with Ken Calder in which he describes his experience of the war including his brief time at the training unit following his tour of Ops. It was a brief tour because of a near crash in training as he decided it was too danderous more so than flying over Germany! Following the end of hostilities Tom was on a "Tour of bombed cities" by the RAF and whilst outside Berlin University pulled down the Nazi flag that is shown in the video. Tom’s father was William Leak and following his time in the Norfolk Yeomanry during WWI training cavalry officers he took over as landlord of the Wrestlers Tap in Yarmouth. This was where Tom was raised and during his time there learned to play the piano which he played in the tap room. His father used to put up posters for the local cinema and in return got free tickets, Tom would use these free tickets to see films of his favourite actor Nigel Bruce. Whilst in Yarmouth Tom became an apprentice printer and started going to church through the person he worked for. Tom left printing to join the Church Army. He went all over England with a Church Army caravan. Then Tom lived in Leicester with friends from the Church Army where he sold insurance. When the war came his old church in Great Yarmouth was bombed by the German planes so Tom enlisted in a part of the forces that would protect Britain from air attacks - the barrage balloons. It is thought he applied in Leicester and was posted to London. At some time during his time in London he went to Lord’s Cricket Ground to enlist in the RAF. He mentions this in a video as well as how his faith was important to him and helped him through the war. After the war Tom worked for Henry Staples by doing clerical work for the cycle shop. Tom occasionally went to evangelical meetings with Henry. Tom met Edith at Henry’s house In Newark when he went to tea. Tom married Edith on 25/03/1948 and lived in Newark first moving into a small 1 bedroom house over a bakery and cake shop in Balderton Gate (Edith worked 2 days a week in the cake shop to pay the rent) later to Millner Street then to Lincoln Road. Tom and Edith had several holidays on Tom’s motorbike, and went around Holland and Switzerland on trains. Tom’s religion was always very important to him and he became an Elder and Secretary at the Sherwood Avenue Pentecostal Church, doing lots of preaching and always laying on entertainment at the parties. Tom always had a big hand in the Newark Annual Church Festival, decorating floats, etc. He was President of the Sunday School Union in Newark. In later life he visited several schools, telling the children about his faith and wartime experiences. Tom also enjoyed bowling. 45. 25/26 July 44 Stuttgart (F/L Chatten).